It’s not about someone making a difference on their own; it’s about everybody pulling together to make a difference. “World of Difference” is part of Rotary International and is managed by Rotary District 9800. Rotary is a worldwide team of every day people that accomplish extraordinary outcomes because they choose to share their knowledge, skills, experience and time for the advancement of other communities. World of Difference has a strong track record of working with Cambodians to break the cycle of poverty that has been thrust upon them through historical events. “Humanitarian Tours” allow you to be a tourist with a conscience because we add opportunities to participate in community building activities with Cambodians in Cambodia as part of your sightseeing adventures. During the tour, participants help out to put the finishing touches to a current project, such as painting a water filter or planting vegetable seedlings. Through “Humanitarian Tours”, World of Difference offers adults and older students, accompanied by a guardian a sightseeing tour led by an experienced Cambodian Rotarian that will take you beyond the experience that most traditional tours are able to offer. World of Difference is able to take you to villages off the beaten track allowing you to activate your senses of sight, touch and feel. 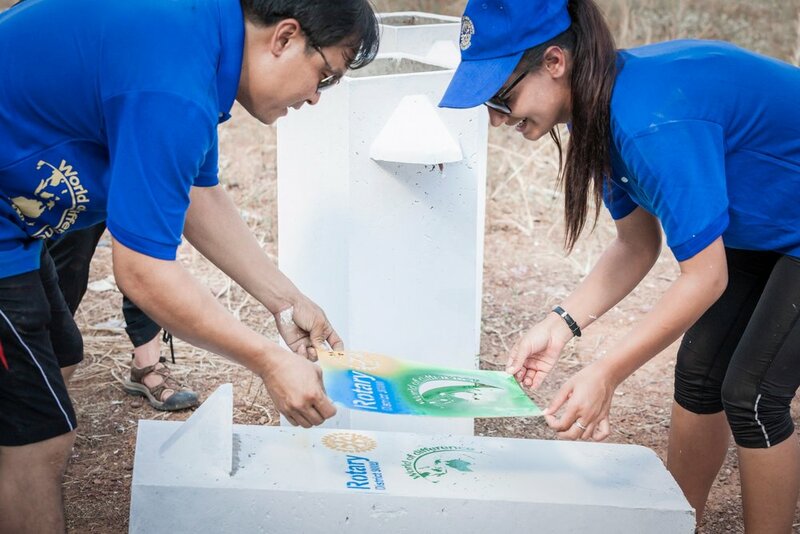 You will see the extraordinary difference Rotarians make through sharing their skills, knowledge and experience in community building activities that are part of Cambodian communities building sustainable change. If you so choose, you can go beyond the boundaries and actually participate for a day or part of day in these projects. This participation will help you understand how easy it is for you to make a global difference. Community building activities range from sitting with students and speaking in English to help them learn a new language, through knowledge transfer, explaining what something means or how it works or why it is done – body hygiene, sewing garments, servicing a pump, to skills transfer by showing how something is done, such as making a cake together, designing a footing for a toilet, treating a wound. You might identify a new project opportunity for Rotary to consider and discover a passion to do more by joining a future “Working Together Tour” that World of Difference leads. Flights to and from Cambodia are included at economy class and your tour cost would be adjusted. You could choose to self book flights to meet your personal preferences. WOD will provide you with the opportunity to get involved in humanitarian activities at many of Rotary’s award winning sustainable community projects.